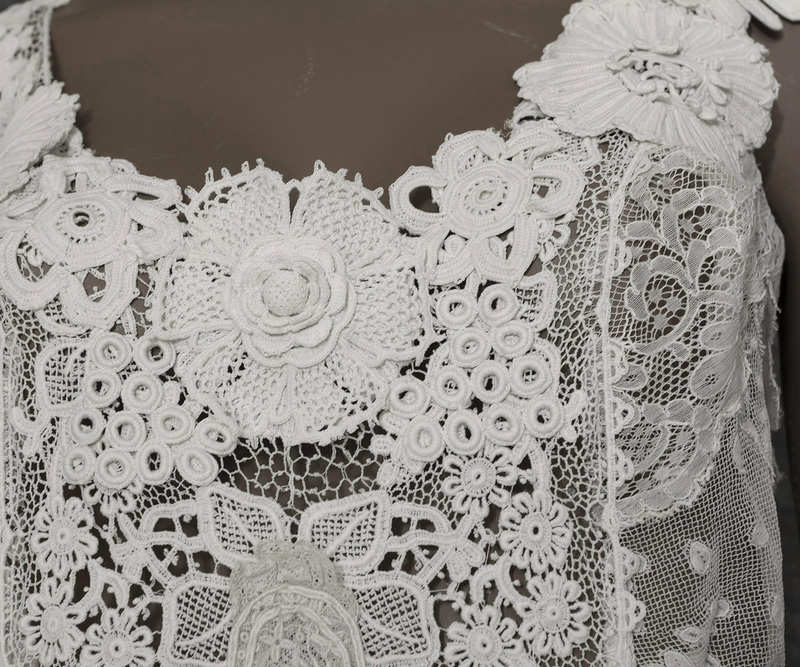 Romantic lace dresses from the early 20th century are perennial favorites. 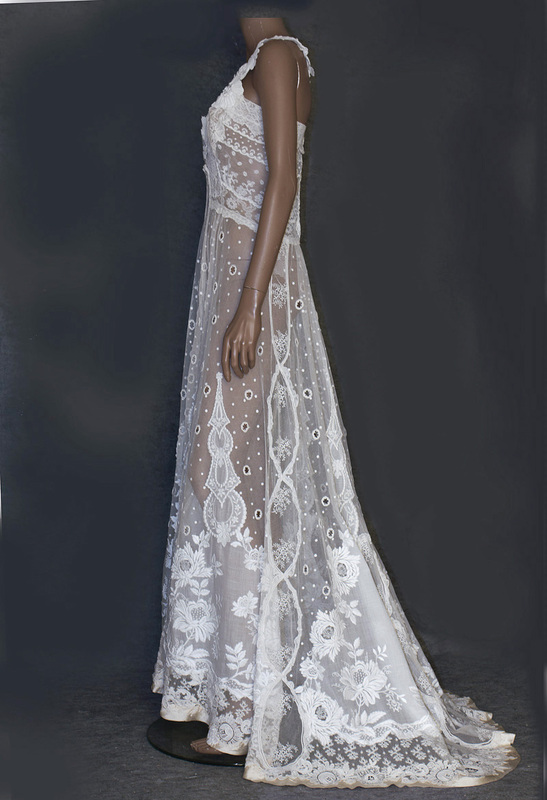 They make lovely wedding dresses, offering one-of-a-kind design for a fraction of the cost of couture. 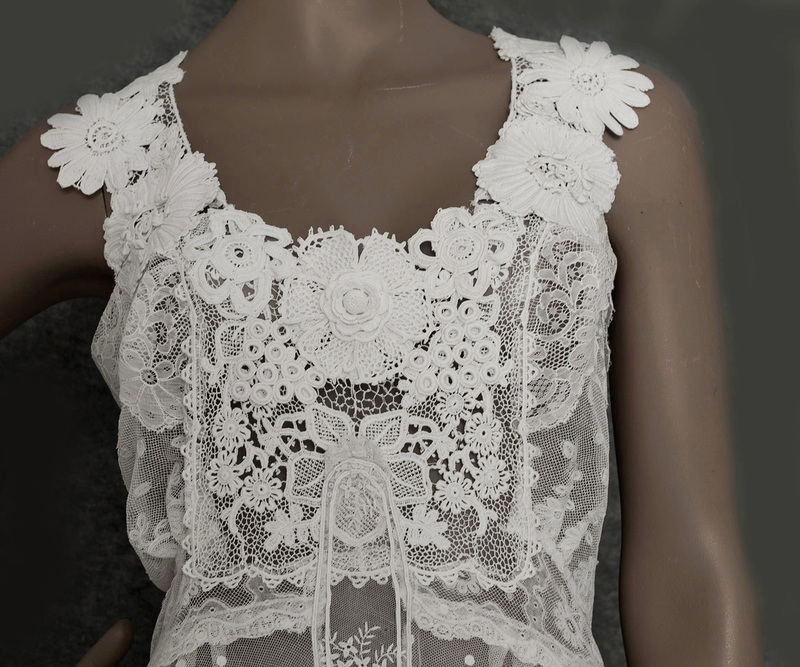 This lovely mixed lace dress could be "something old" on your special day. 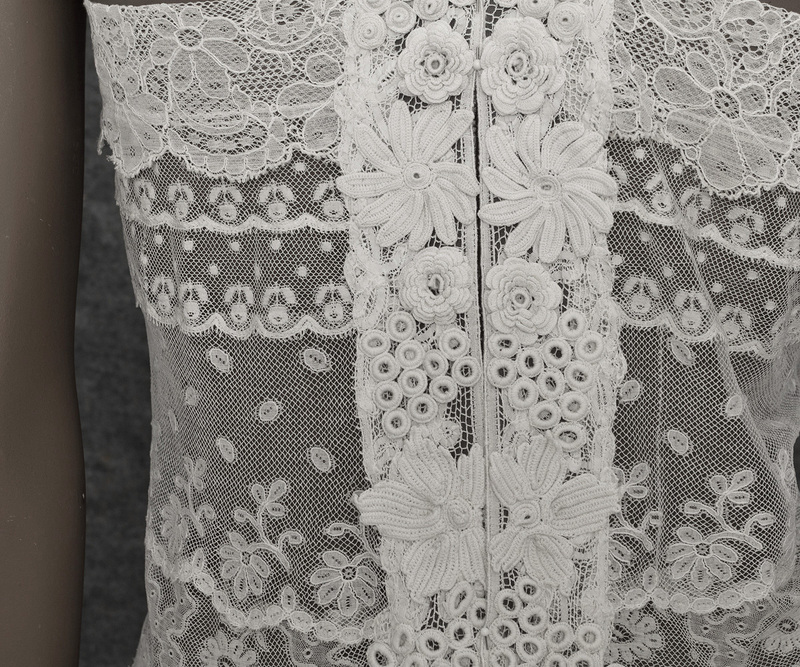 The dress features a delightful mix of embroidered panels, machine lace, and handmade Irish crochet flowers. 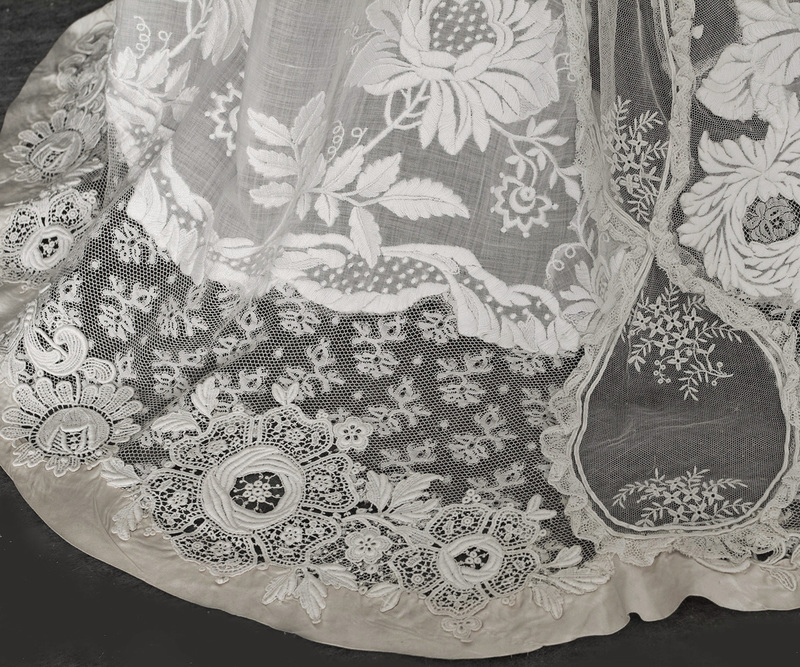 In this symphony of lace, many details of execution are likely to remain unobserved. They are like parts of an orchestra score to which the composer has devoted infinite labor, though they may never reach the ears of the public. The smallest detail is a precious thing exemplifying the special excellence of the whole. 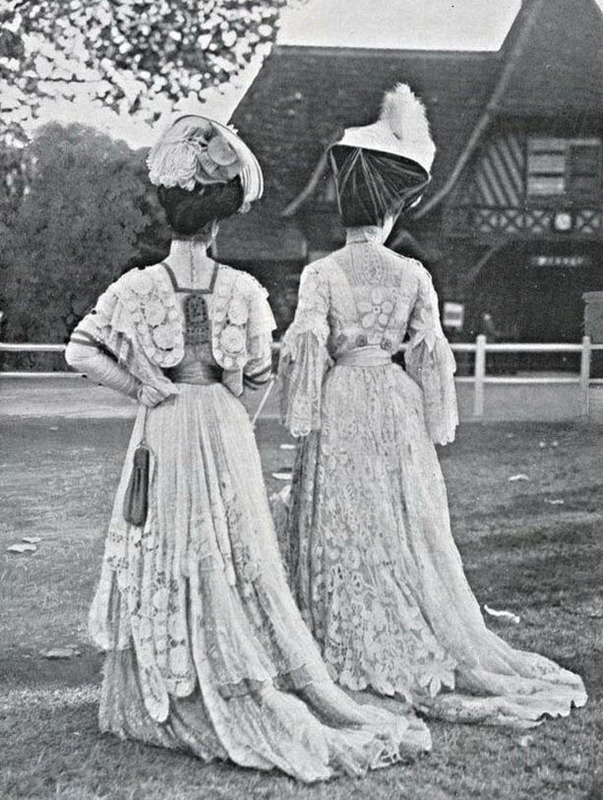 In the above picture of two Edwardian beauties, we see similar mixed lace/embroidery skirts. On the skirt panels of our wedding dress, an array of lace floral motifs complement (and compliment) the large padded satin-stitch embroidered roses. Humbler flowers wait attendance on their Queen Rose. Come hither, the dances are done. As often with early 20th century dresses, the original underpinnings are missing; the bodice was likely altered. Nevertheless, this wearable antique is perfect as a wedding dress although it may not be suitable for a museum. Without the original underpinnings, the dress is sheer and will need an undergarment. A full length, strapless, flared bridal petticoat would be perfect. The dress closes in back with small hooks. The hem is bordered with cream colored satin. The condition is almost excellent. The dress has been cleaned and is ready to wear. Just add a slip. It measures: 36" bust, 29" waist, 42"+ hip, and 58" from shoulder to front hem.